As is the case with all developing hockey players, the ultimate personal and athletic goal is to one day play in the National Hockey League. In order to reach this goal, each and every player must embark upon a unique journey. For most, this journey involves development at the major junior level, most commonly through the Canadian Hockey League and its three individual leagues. Although this particular path is typically seen as greatest in terms of quality of competition and player exposure, it is not a prerequisite for future success. Other successful pathways to the NHL exist, however these paths are those less travelled, and although they are typically more challenging, they tend to offer an ultimately more rewarding journey from both a personal and athletic perspective. This is the path which goaltender Benjamin Patt has chosen to walk. At the age of 18, Patt has already enjoyed a hockey career rich in both quality and experiences. Following a considerable stint in the Greater Toronto Hockey League (GTHL), Patt, rather than holding out for selection in the Ontario Hockey League draft, chose a more intellectually and personally stimulating experience, accepting an offer to play at the Canadian International Hockey Academy (CIHA). Located in Rockland, Ontario, CIHA is situated east of Ottawa on the shores of the Ottawa River. Born and raised in Brampton, Ontario, living away from home at the age of 16 was a major cultural shift for Patt, as for the first time in his life he was living on his own. Although the CIHA team did not enjoy outstanding success, Patt grew tremendously as a hockey player, receiving instruction from top hockey trainers while concluding his second last year of high school. Following his time at CIHA, Patt ultimately decided it was time to move on to a greater challenge, accepting an offer to play at the PEAC School for Elite Athletes. Based in Toronto, Ontario, Patt continued to play an increased quality of hockey, competing against elite AAA teams and prep schools throughout the United States such as Shattuck St Mary’s, which has produced NHL players such as Jonathan Toews, Zach Parise, Nathan MacKinnon and Sidney Crosby. All in all, Benjamin enjoyed a successful season with PEAC. Not only did PEAC win various tournaments, but Patt was honored with the Under-18 Award for Best Goaltender. Alongside his success in hockey, Patt successfully completed the final year of his high school education, making his time with PEAC successful from both a personal and athletic perspective. Following his graduation from PEAC, Patt was immediately faced with an incredibly difficult and immense life decision. Would he attend camp with the reigning Ontario Hockey League champion Guelph Storm, or would he keep his National Collegiate Athletic Association (NCAA) eligibility intact? If Patt chose to attend training camp with the Guelph Storm, the time spent with the team would dissolve his opportunity to pursue an NCAA scholarship. In the end, Patt elected not to join the Guelph Storm. A potential University scholarship and education would simply be too great of an opportunity to pass up. As a result, Patt reviewed a plethora of offers from elite development teams throughout North America. 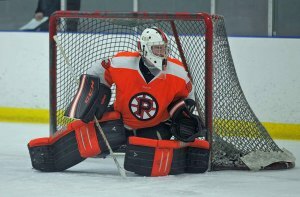 Hockey clubs from Alaska to Texas showed considerable interest in Benjamin, all of which were seeking to add en elite goaltender. Eventually, Patt accepted an offer to attend the Athol Murray College of Notre Dame located in Wilcox, Saskatchewan. The decision would ultimately allow Patt to continue his education, retain his NCAA eligibility and play for the Notre Dame Hounds of the Saskatchewan Junior Hockey League (SJHL). Brett Slawson (THW): Ben, you’ve had the opportunity to play in multiple provinces and even countries, how does hockey in Saskatchewan compare to where you have played in the past? THW: Wilcox, Saskatchewan is a small of town of a little over 400 people, how have you enjoyed your time there so far? THW: This is your first year playing hockey at the Jr. A level, how has the quality, or difficulty, of hockey altered from where you have played in the past? THW: Every goaltender plays a unique style of hockey, whether it be standup, butterfly or hybrid, how would you characterize your style of goaltending? THW: Based on your hybrid style of goaltending, what NHL goalie would you compare yourself to? THW: Benjamin, one final question to wrap up the interview. You seem to be surpassing your goals and finding success everywhere you play, ideally, what is the next step for you in your hockey career? Benjamin Patt has enjoyed great success in his rookie year in the SJHL. 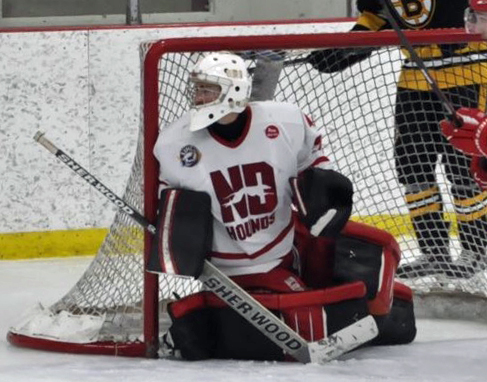 The Notre Dame Hounds, who at one point this season were the number one ranked Jr. A team in all of Canada, are having a fantastic season, largely in part to Patt’s strong work in net. Patt, who posted two shutouts in his first six SJHL games, was recently named as an SJHL player of the week, while he was featured in the “Who’s Hot?” segment after recording a shutout, a 0.72 GAA and .973 Save Percentage in winning three straight games. Clearly, Benjamin Patt has cemented himself as a budding hockey prospect. His hard work and dedication have seen him enjoy countless success at various levels of hockey throughout North America. Although his hockey future remains somewhat unclear, one factor remains certain, Patt’s determination to become the best hockey player, and person, he can be.